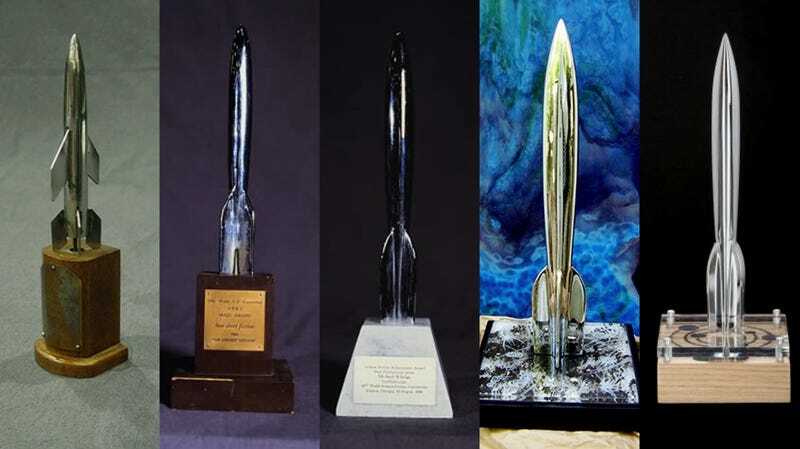 A collection of Hugo Awards from 1953, 1961, 1986, 2011, and 2016. The World Science Fiction Convention, otherwise known as Worldcon, is starting over from scratch with its 2018 programming. Chair Kevin Roche has announced the convention is redoing its entire panel lineup after facing backlash over misgendering a Hugo Award finalist as well as reportedly rejecting panels from diverse creators, and denying panel spots for newer authors—Hugo nominees among them—for not being famous enough. Over the weekend, writer Bogi Takács revealed that eir Worldcon 76 bio had been rewritten to misgender em using masculine pronouns. After discussing the situation on Twitter, program division head Christine Doyle replied saying she had taken the bio directly from eir website, which Takács later noted would be impossible seeing as how e never goes by he/him. Following reports that Worldcon has reached out to Takács’ partner with a backhanded apology that suggested Takács shouldn’t have gone public with criticism, Roche has since personally apologized to Takács. This event led to an outpouring of support—and criticism of Worldcon—from panelists, creators, and fans, but it was only one part of the criticisms the convention was facing this year. One of the bigger issues that surfaced was a report that some lesser-known creators were left out of panels for not being well known. In addition, some who had submitted panels had their ideas rejected or, as claimed by writer Greg van Eekhout, had a panel idea they proposed given to other people. In response, several writers and artists—including io9's founders Charlie Jane Anders and Annalee Newitz—announced that they would not participate in any of Worldcon’s programming this year, saying they wanted their spots to go to newer creators. Others, like Hugo winner John Scalzi, have also shared their experiences as budding writers and artists, imploring Worldcon to give newer creators the same treatment they received when they were first starting out. While Worldcon 76 works to redo its programming, it’s unclear how it’s responding to creators who’ve already pulled out of the conference (like 2017 Hugo winner N.K. Jemisin) or whether disciplinary action will be taken internally in response to what happened. io9 reached out to Worldcon for comment, and we’ll let you know if they respond. Right now I am waiting to see how the situation develops. The LGBTQ+ Initiative at Worldcon funded my membership and I have also been in contact with them - Chuck Serface has been very supportive. I am also in touch with many other writers, including people who offered the con to revamp programming. I don’t know how much of this is public, so I’d prefer not to share details. But in the meanwhile, I am simply waiting to see what will happen. I seldom have an opportunity to attend cons, and was very much looking forward to Worldcon this year—this also motivated me to speak up about the issues I saw related to programming, not just concerning myself, but many other friends and colleagues. The issue about them rewriting my bio was just a very visible facet of larger structural issues, and something that I could point out without breaching confidences.